Ubud, Bali. Our favorite place to date. We stayed in Ubud for our first five nights before going to Sanur. We love Sanur and our Airbnb there has turned out to be the best we’ve ever had. That said, we still dearly miss Ubud. However, we’ve found that Ubud makes a great day trip destination. So whether you’re staying in Kuta or Sanur or Seminayak, Ubud is just a short drive inland and very affordable. We recommend using a Grab or Go-Jek to get there. You won’t have to bargain with a taxi and you’ll save some coin, which is awesome because you’ll want to spend it on a massage or smoothie bowl. 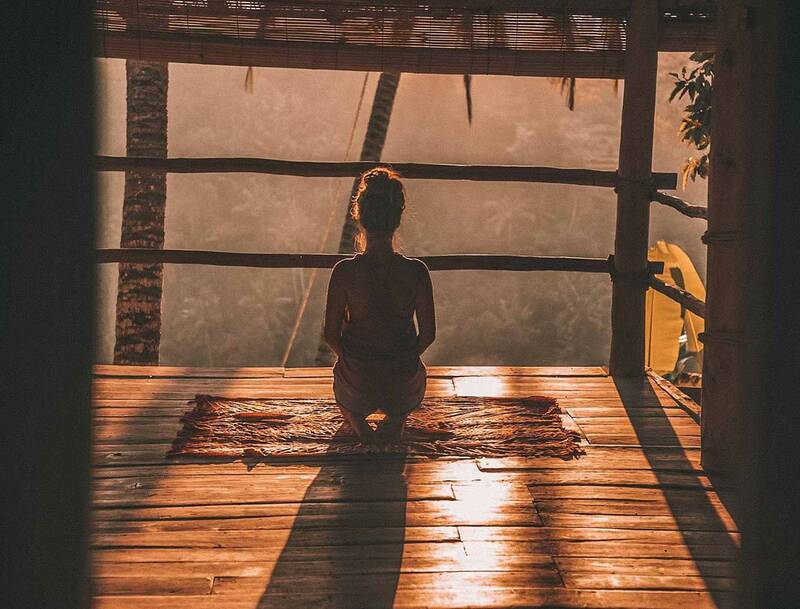 It seems that Ubud is synonymous for Yoga Barn. Everyone who talks about Ubud mentions going to the Yoga Barn. They offer many different yoga classes throughout the day and most of the classes are appropriate for beginner yogis. Each class offers a different type of practice from Vinyasa Flow to Tai Chi to Acroyoga. If the Yoga Barn doesn’t suit your fancy there are many more yoga studios throughout Ubud. And throughout Bali in general. Yoga is everywhere. It’s awesome. If you decide to go to Yoga Barn then keep in mind that their classes can fill up quickly. They’re first come first serve so show up early to make sure you can get a spot. Cost: One class at Yoga Barn costs around $8.50 USD but they offer classes that drive the cost per class down and even an unlimited monthly pass for $171 USD. Start your morning off right with a smoothie bowl. 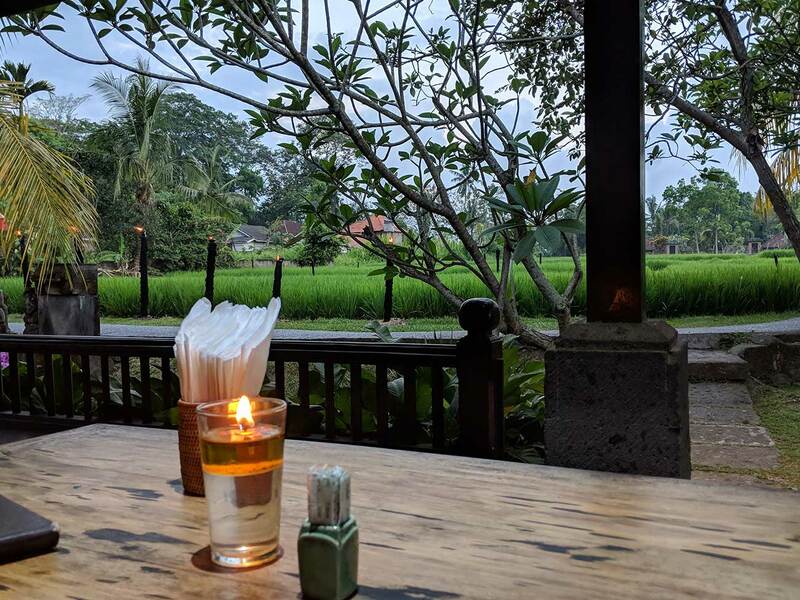 We wandered into a restaurant in Ubud called Pundi Pundi with the intention of ordering coffee and using their free wifi (free wifi is everywhere). What we didn’t realize was that they had these amazing things called smoothie bowls. 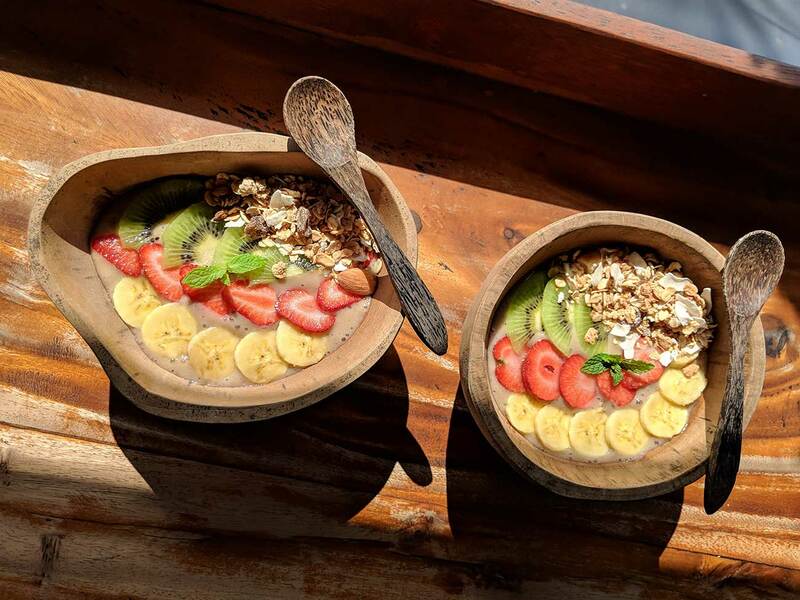 Smoothie bowls are smoothies blended with fresh fruit and placed in a bowl and topped with granola, honey and slices of the same fruit that are in your smoothie. 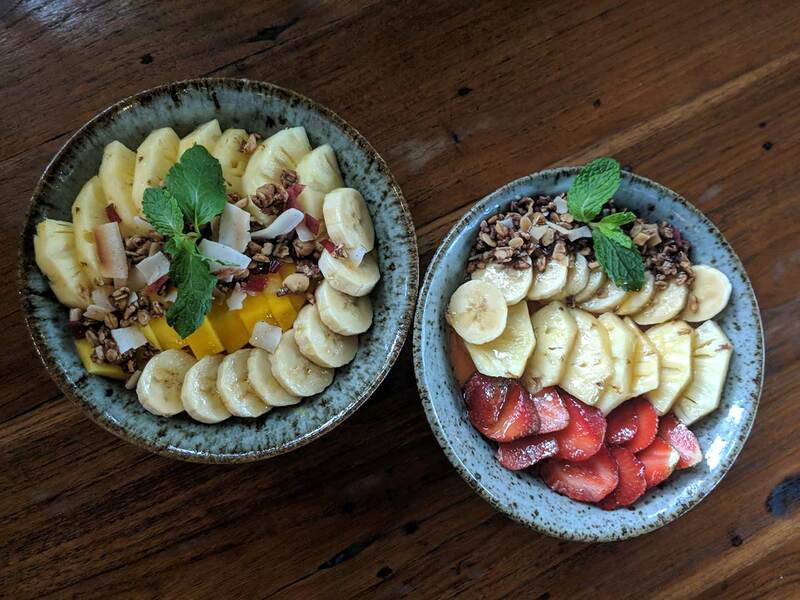 We tried many smoothie bowls in our trips to Ubud but none compared to Pundi Pundi’s. If you want a fancier and more sugary smoothie bowl then check out The Spell Creperie, a Celtic-themed cafe with great eats, cool seating, and a mystical vibe. Do expect to pay a little more as this is more trendy. Not only do many restaurants offer smoothie bowls, most offer some sort of fresh juice, smoothie or a sort of “healer” or “elixir”. Having our diets torn to shreds in Taiwan and Thailand, Bali helped get us back to a healthier routine. Be sure to try their drinks with ginger or lemon or mint. So delicious! Cost: Pundi Pundi smoothie bowl runs around $4 USD and is a large serving. 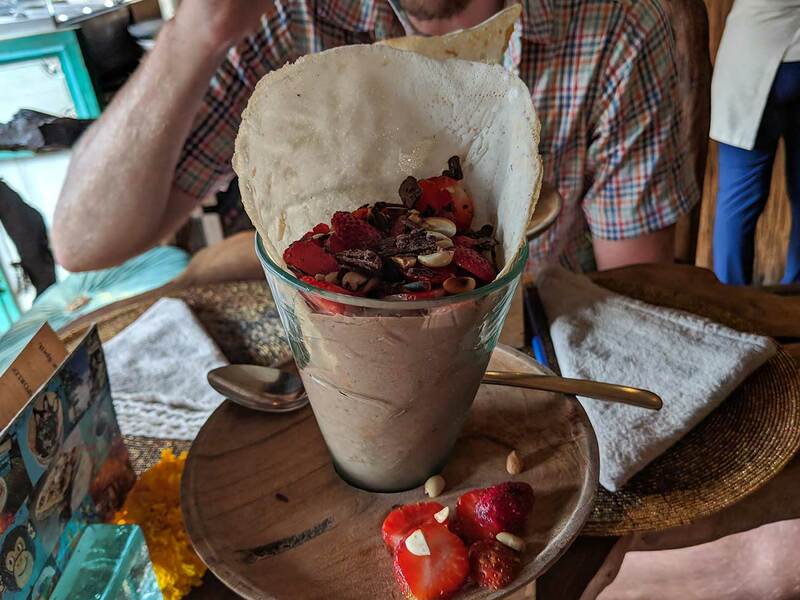 The Spell Creperie smoothie bowl ran around $5 USD and was a smaller portion but used sweeter ingredients. 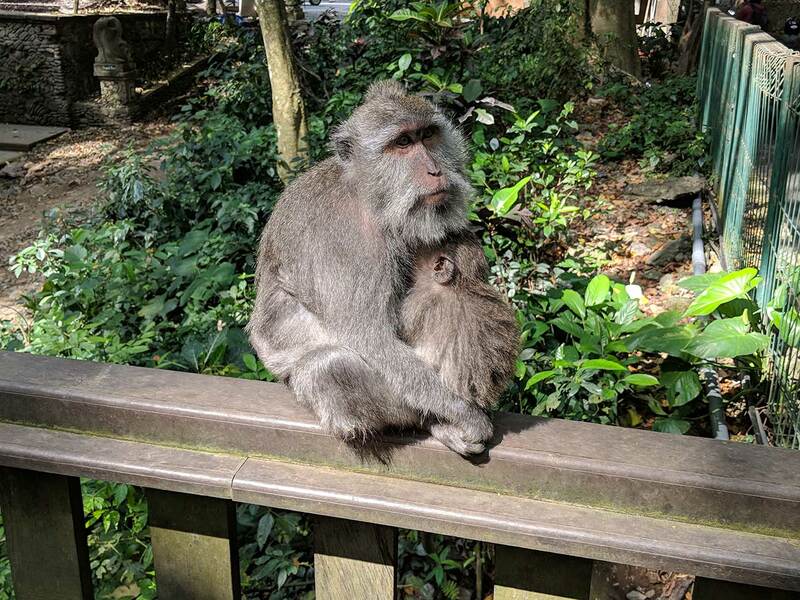 Near the south end of Ubud, this forest is a towering canopy with streams, temples, and of course, monkeys. Lots of monkeys! Doing research online before we went, it seemed like the monkeys would be thieves and carrying a bag was a bad idea. We did not have this experience. While we kept both eyes on our belongings and made sure to hold on tight, the monkeys minded their own business and put on a great show. There was a sizable crowd the day we visited and having been in the area several times, it seems there always is. 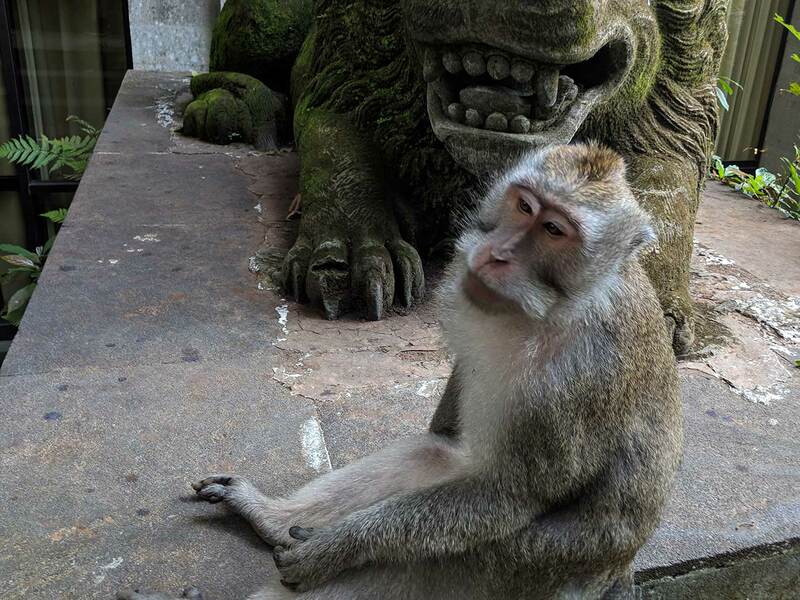 The forest is quite large and you can take a relaxing stroll and enjoy nature, all while the monkeys do their thing. Whether that’s jumping from person to person, quarreling in the middle of the avenue, or picking bugs off each other, you’re in for a treat. This was one of our first things to do in Ubud and was more than worth it. Cost: Around $3 USD per person. Wow! The temperature outside can get pretty toasty before those afternoon clouds roll in. 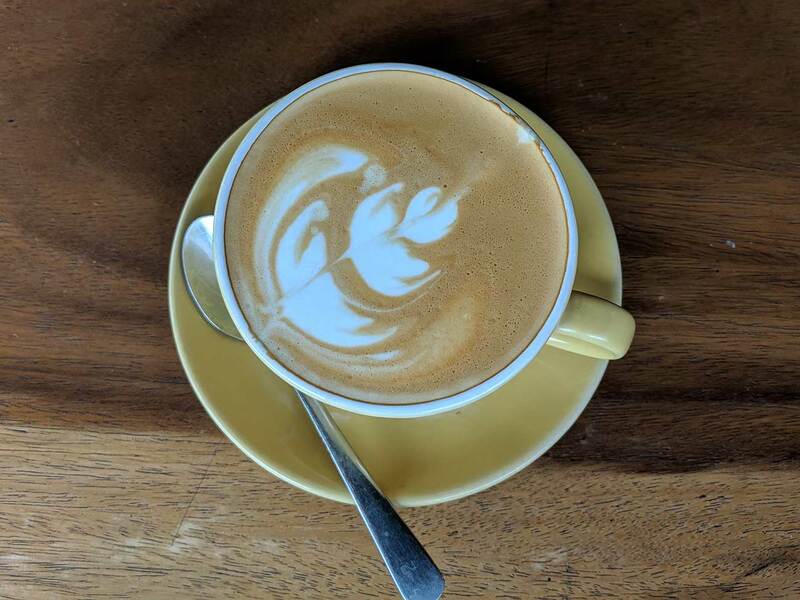 Anuman Coffee is the perfect cafe to kill some time while you wait for some cooler weather. Ubud is overrun with coffee shops and we lucked out by finding Anuman as we walked past. Anuman Coffee was our favorite because it’s kind of hidden, has great seating, and is super cheap. You’ll find the coffee shop up a narrow staircase and can sit at some bar stools overlooking the street below. A cool breeze blows, making a hot Bali coffee or latte desirable. They serve good food as well, including smoothie bowls, but we prefer just to have a drink and chill. Having been to several other cafes in Ubud, Anuman Coffee seems to be less trendy, therefore cheaper. We’re okay with that! Cost: A cafe latte will run you just over $1 USD. We usually have a few. 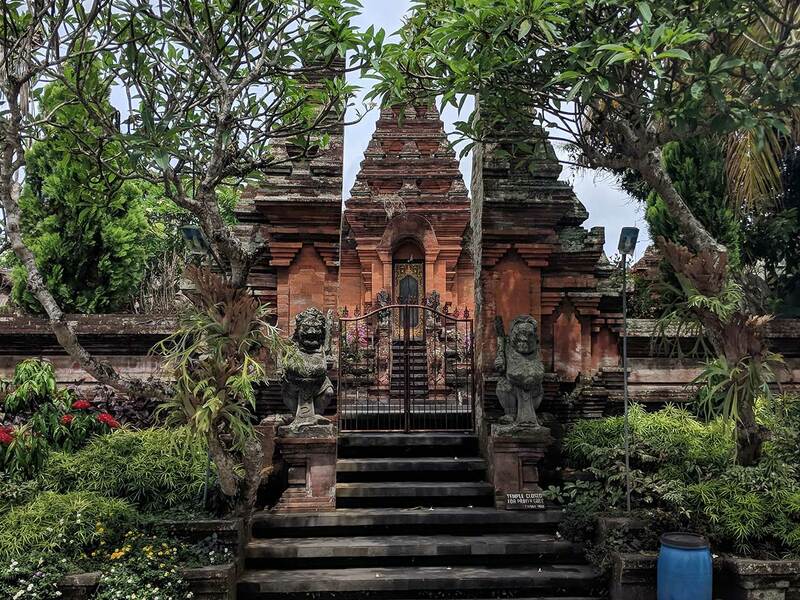 There are 3 types of temples in Bali. Family Temples, which only can be used by the people with the same bloodline. Community Temples, which can only be used by the people in that community. And Public Temples, which are free for people (even foreigners) to visit and appreciate. You can still appreciate Community Temples from the outside and if you’re able to visit a family commune you’ll be able to see their Temples as well. 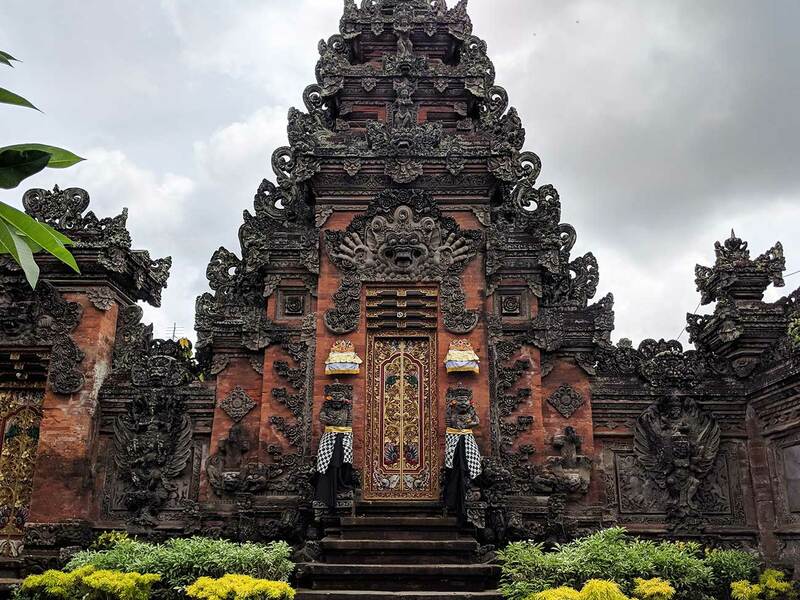 The best part about the temples and even the main gates or walls around the family communes are the intricate stone carvings and the beautiful statues. 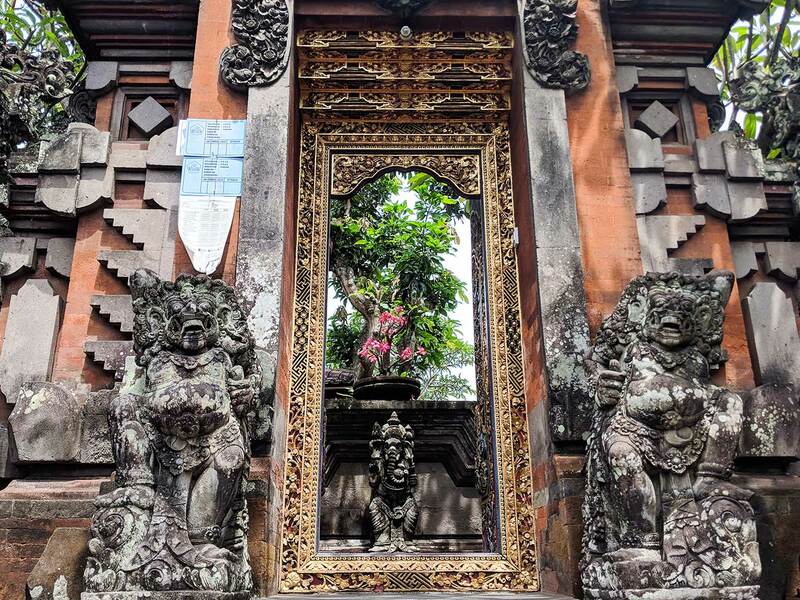 Take a stroll through Ubud and you’ll be able to appreciate the immense detail put into their buildings. This is really a must-see market. It’s multiple levels and there are so many beautiful trinkets, clothes and artwork to see. 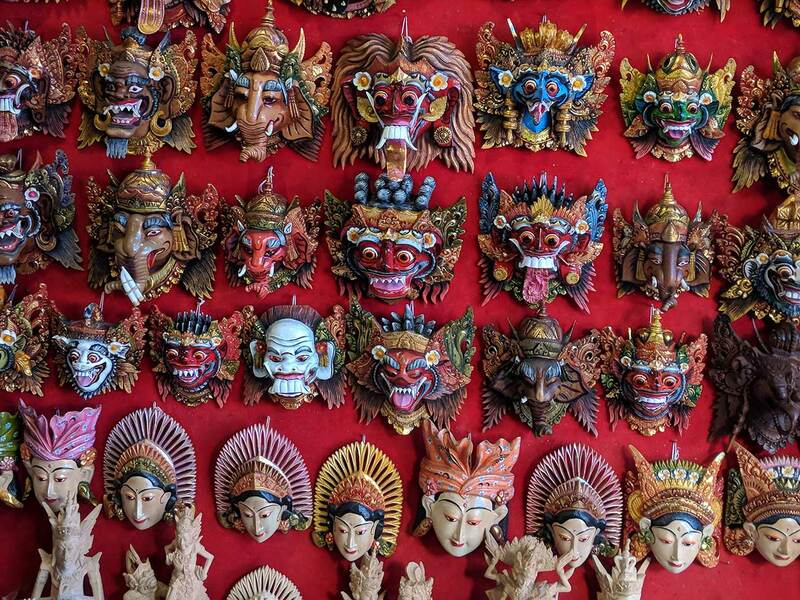 You can find anything like hand-carved wooden bowls, woven place mats, knives with wooden handles, colorful masks, silver jewelry, traditional Balinese clothes and much more. 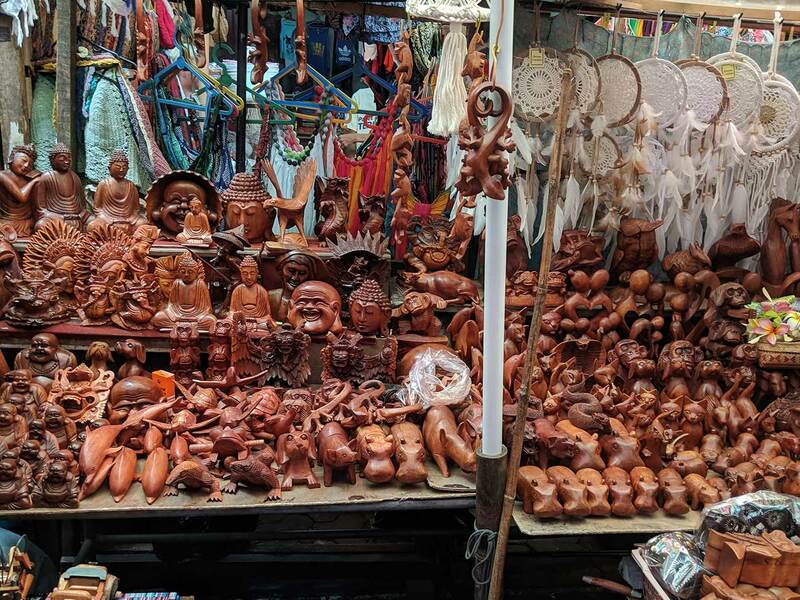 You could spend hours looking around this market for the perfect souvenir to take home. We want to buy a whole kitchen set but we’re returning to Taiwan before heading to Europe for who knows how long, so probably not the brightest idea. We’re trying to keep this post concise so we won’t spill our guts over all the amazing places to eat in Ubud. From super touristy to straight-up local Balinese warungs, Ubud has it all. 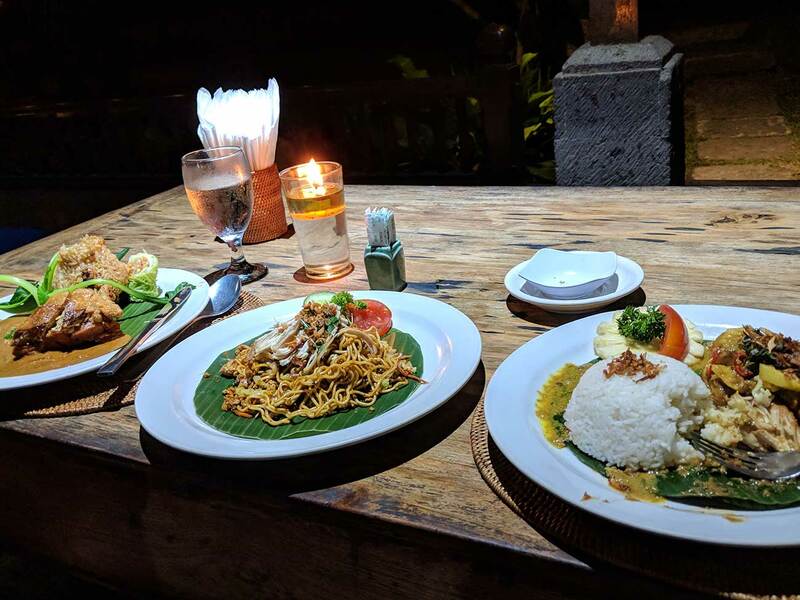 We want to mention Laka Leke because it seems to appeal to tourists but they serve delicious local Balinese food that you would find at a warung. 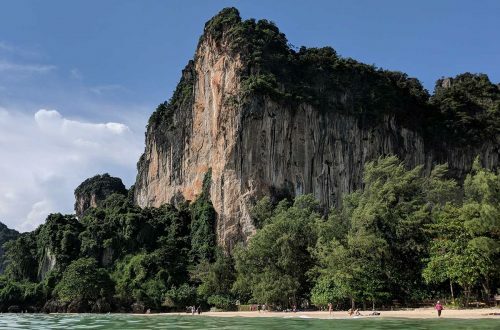 What makes Laka Leke special is the view. You look in the distance and see green rice fields, candles are lit, and you’re surrounded by beautiful gardens and fountains. Oh, and it’s super cheap too. Our helpings were very large and we left stuffed. Cost: Around $10 USD for two people. We had three food-filled plates and water. No alcohol. 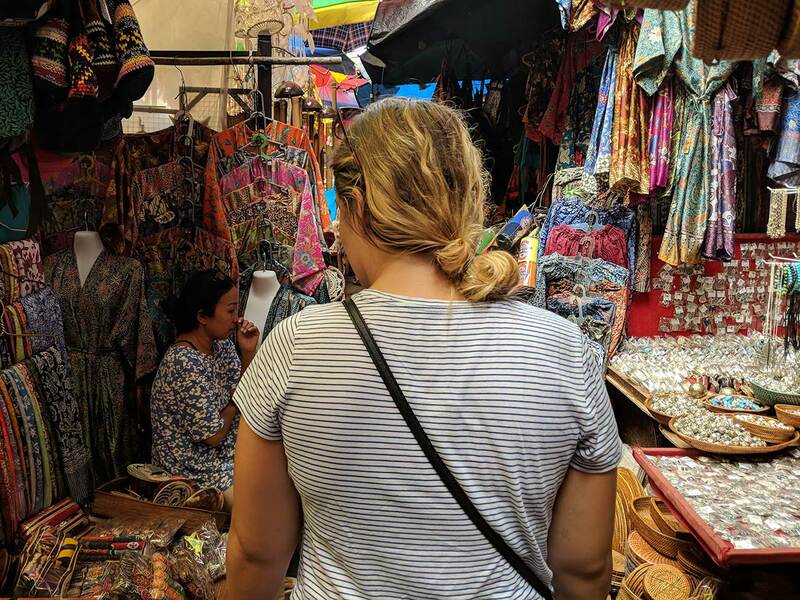 We came to Bali from Thailand, where we got Thai massages and then were pestered to buy an island tour or snorkeling package or whatever. 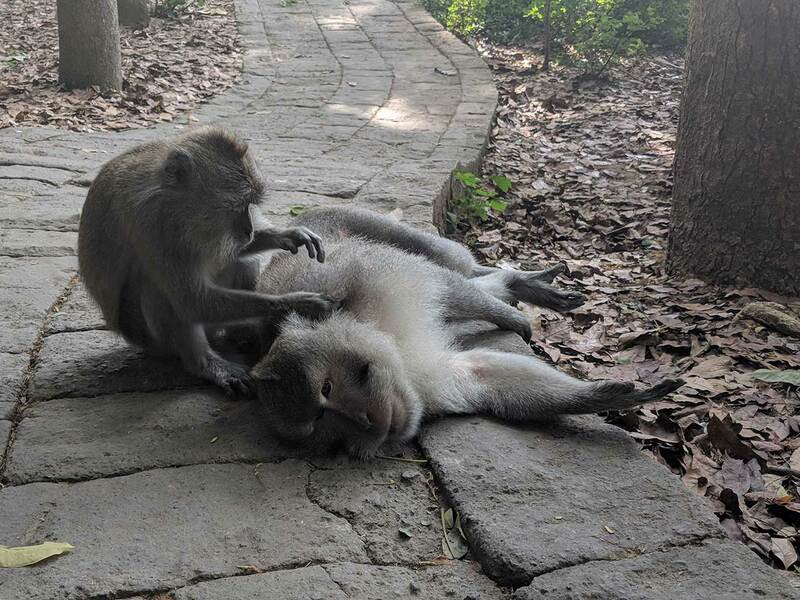 Massages in Thailand were nothing compared to what we’ve had in Bali. In Bali, we ask for a massage, we get a massage. We pay, say thank you very much and leave. That’s it! It was a relief to just be able to relax and enjoy. The first massage we tried in Ubud was at Le Wax Beauty Salon and Spa and we highly recommend! Do note that this place is more expensive than your average Bali massage, but we’re only talking like a few more bucks per person. You’re greeted with lemon water while your feet are washed with lime in rose water, you get an amazing massage in a dark, peaceful room, and you end the day with some tea. The few extra bucks are worth it!. That said, we’ve gotten massages elsewhere and they’ve been great. But nowhere has had the hospitality like Le Wax. 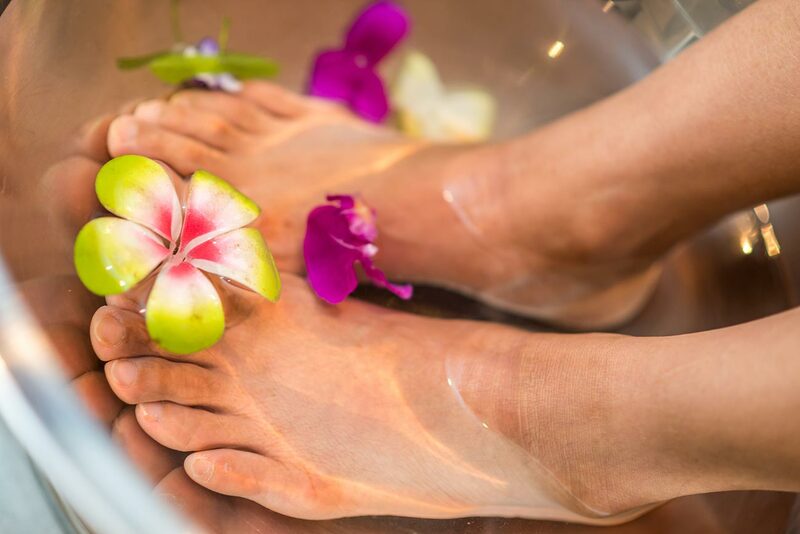 Either way, get a Balinese massage, a back massage, or the reflexology. You won’t be disappointed! Bali is the best! Cost: It’s about $8 USD/hour for a Balinese massage at Le Wax. However, we’ve also had an hour Balinese massage for $5 USD/hour, just without the fluff. We don’t want to tell you what to do with your life, but you need to go to Ubud, Bali. From the busy markets to the chill vibe of all the yogis in town, you’re in for a wonderful and tasty treat, but most importantly, a peaceful one. If you’re staying near the Ubud area then be sure to check out a cooking class! Read about our awesome experience here. 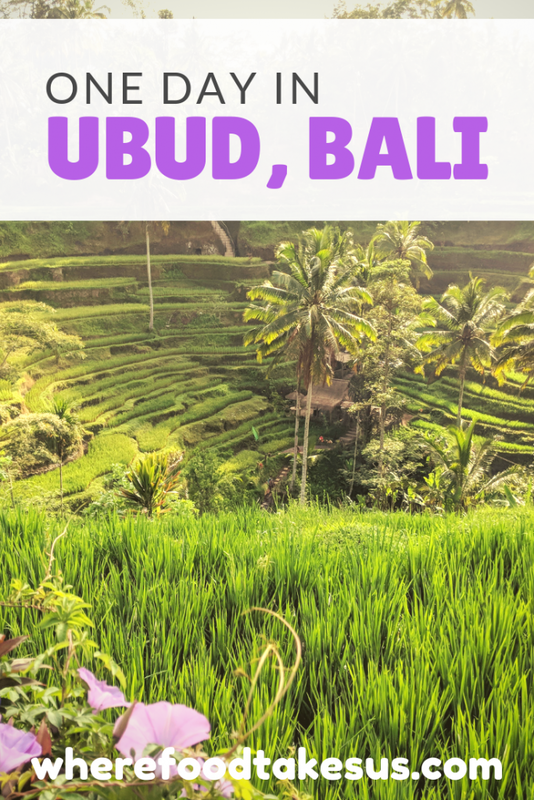 Have you been to Ubud? Share your experience with us below! Learn to Surf in Bali: Catch Some Waves in Kuta!